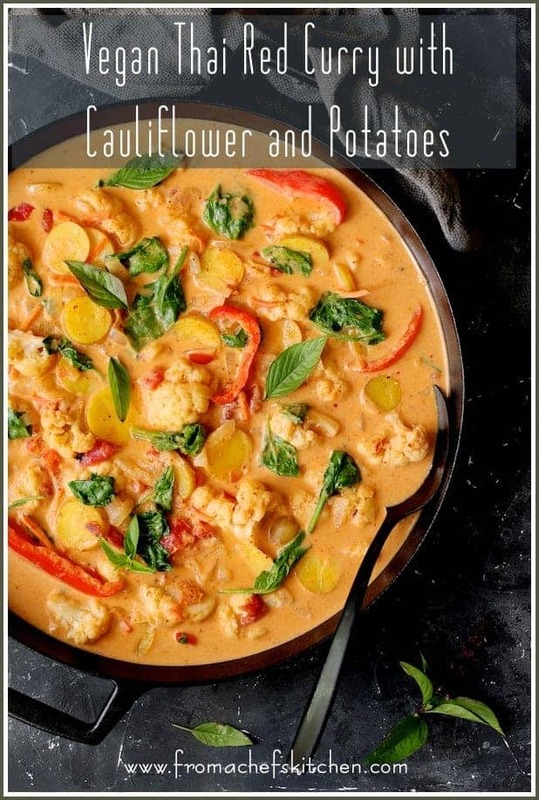 Vegan Thai Red Curry with Cauliflower and Potatoes is spicy and delicious with a side of healthy! It’s the perfect veggie-packed meal to warm you up on a chilly fall night you won’t feel guilty about! I actually had other plans for this head of cauliflower. Then, it got to be Saturday night. I realized there were a bunch of vegetables in the refrigerator–including the cauliflower–that needed to be dealt with before the week began again. Has that ever happened to you? You buy a bunch of things that look so beautiful and so fresh and then gasp… You have to do something with them or else! 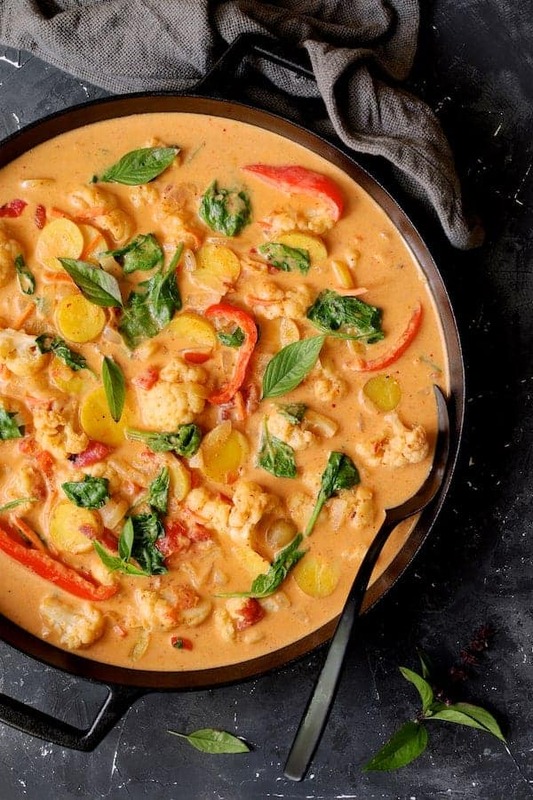 Vegan Thai Red Curry with Cauliflower and Potatoes is what to make when you have too many vegetables! But of course, use whatever vegetables you have that need to be used! This may be controversial when it comes to someone who cooks for a living, but I no longer make my own red curry paste. I discovered Maesri (affiliate link) at a local international food market and I don’t see a reason to make my own anymore! I don’t care for average grocery store red curry pastes because I find them wimpy. However, Maesri is the perfect substitute! It’s spicy, full of authentic flavor and inexpensive! This dish is super-easy! Saute the onions, red bell pepper and potatoes. Add the vegetable broth, coconut milk, the spices and bring to a boil. …The cauliflower and simmer away! 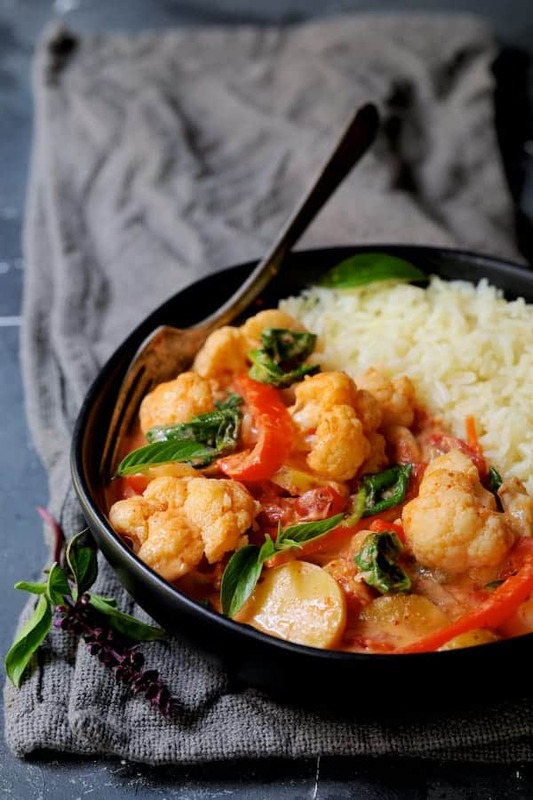 Then add the remaining vegetables…..
Vegan Thai Red Curry with Cauliflower and Potatoes is a spicy, healthful, delicious vegan dinner you won’t feel guilty about! Serve with brown or white jasmine rice. Delish! Be sure to check out my other veggie-packed Thai-inspired meals! 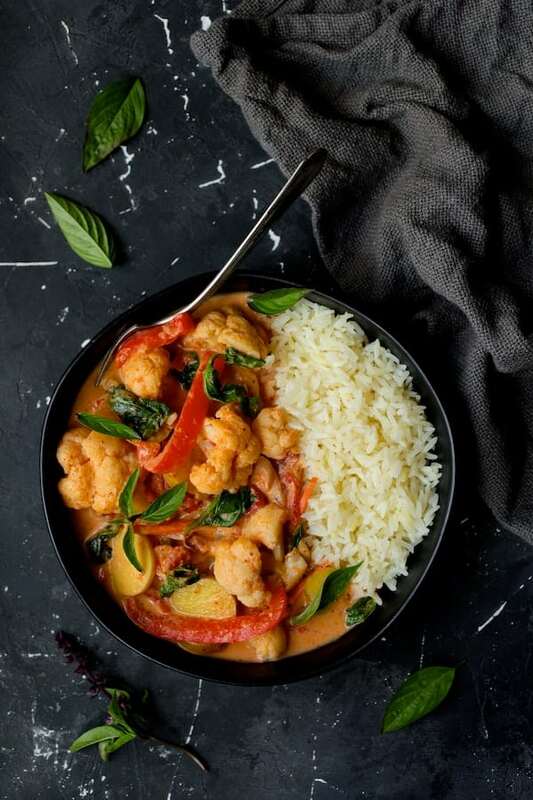 Vegan Thai Red Curry with Cauliflower and Potatoes is spicy and delicious with a side of healthy! It's the perfect veggie-packed meal to warm you up on a chilly fall night you won't feel guilty about! Heat canola or coconut oil over medium-high heat in a large skillet or saute pan. Add the onion and cook 5-8 minutes or until beginning to soften. Add the red bell pepper and potatoes and cook 2-3 minutes. Add the vegetable broth, coconut milk, tomatoes, red curry paste, garlic and ginger. Bring to a boil. Add the cauliflower florets. Reduce heat to medium-low and simmer 8-10 minutes. Add the carrots. Cook another 5 minutes. Add the baby spinach and stir until wilted. Garnish with fresh Thai basil leaves. Hi, Irene, Thanks so much for your question. I totally hear you on the coconut milk. It IS high in fat and calories but it’s soooo very flavorful! Every so often I indulge, enjoy and don’t look back. You could use light coconut milk or a nut milk, however, the dish is going to be thinner so you may want to use a thickener. Thanks again and hope it works for you! Hoping to make this! Is it suitable for freezing? Hi, Rosie, Thanks so much for your question! It can be frozen, but keep in mind any vegetable is not going to be quite the same. Vegetables have a lot of water in them which impacts how they do after freezing. This dish is going to stay quite flavorful for several days so you might even finish it up and not need to freeze it! Thanks again and hope you enjoy! MMMmmmm just looking at this dish transports me back to a magical, curious land. I love love love the versatility of Thai food. 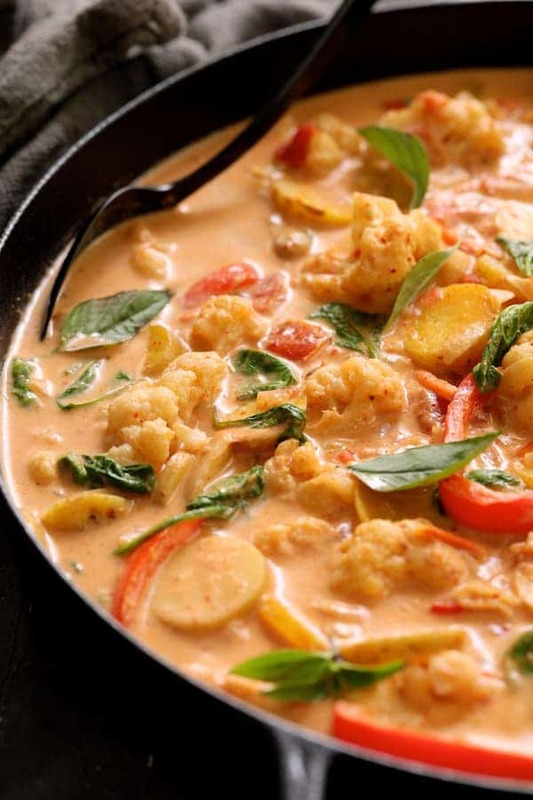 Keep your curry flavor base, get creative with your veggies and proteins. Thanks for the inspiration. Thanks so much, Analida! I agree! The versatility and it’s so healthy! Thanks again!